I aIways love discovering new products, restaurants, books, recipes, stores, etc. … and then sharing those finds with friends. With that in mind, when I find new and exciting things, I’m going to share them with you! I hope you’ll share your exciting finds with me too! Every morning, my husband and sit together at our kitchen table and read the paper over a cup of coffee. 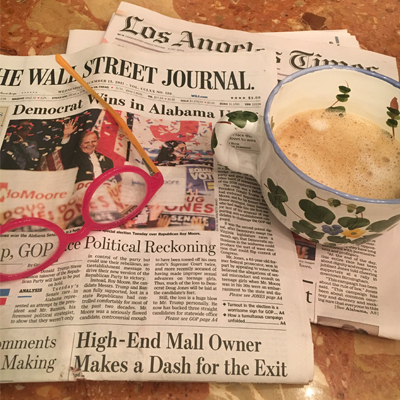 No morning shows or TV … just quietly reading the paper. During the week we read the Los Angeles Times and the Wall Street Journal, and on the weekends we read the Los Angeles Times and the New York Times. Hand-painted by the fabulous jdg, these groovy shoes are fun, creative and totally unique. Each pair is made to order, so you won’t find them in any store. Instead, visit www.paintedbyjdg.com to see her designs or even ask her to something new and special for you! 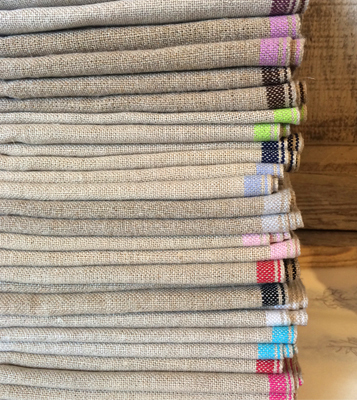 Made by a small, family-run business in Plettenberg Bay, South Africa, these linen napkins are woven on antique looms and are 100% linen with a “true” salvage (the color salvage edge if part of the continuous weave; not sewn on). Unfortunately, these aren’t available online, so to find out more about ordering, call my friend Carrie’s store, 626.577.3400. And to see more of the great stuff she carries, visit Maude Woods online. 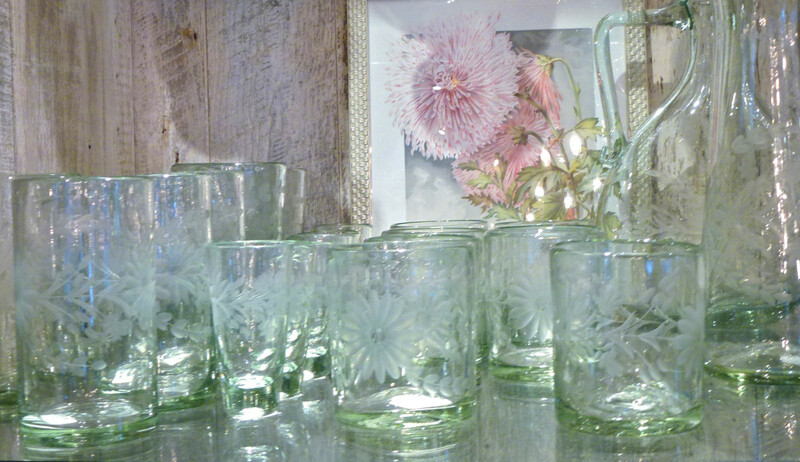 I admit, I love almost everything at my friend Carrie’s store, Maude Woods, but these Santa Rosa etched glasses, which are handmade in Mexico, are so beautiful! Tall glasses, cocktail glasses … even shot glasses. I want them all! I have fallen in love with these Potterseed Ramekins, available at Maude Woods. 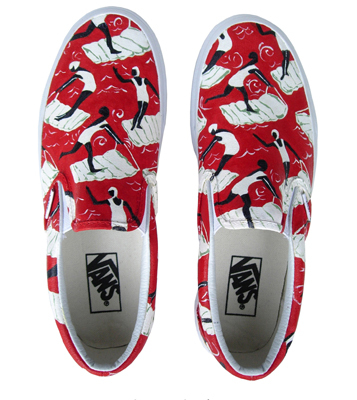 Each one is handmade and painted by artisans in South Africa, and has its own unique color-way and pattern. Check them out online or, if you’re in the Pasadena area, stop by and visit my friend Carrie’s store! Where do you get your gorgeous eye glasses? Those glasses are beautiful!!! I am drawn to things green it seems. I moved to Alabama from Southern California 6 years ago and maybe it’s all the trees here! Just looked at her online shop..beautiful unique finds! But those glasses are my favorite. I’m here this morning, just looking around at your site. Normally, that’s a Thursday thing because that’s when your blog comes out, but I came impulsively today, and clicked on Favorite Picks for the first time. I read about your friend Carrie’s store and started thinking. Starting a business from the ground up can be a huge undertaking, yet you’ve done it with your pie business, your friend Carrie has done it with Maude Woods, and even your pal Kristian Alfonso has done it with her jewelry line. You know quite a few people with that entrepreneurial spirit! I’d like to hear Carrie’s “how I got started in business” story if she’d like to tell it! I’ve been a DOOL watcher since 1965 or ’66, wow, that’s a long time. You’ve always been 1 of my Favorite Characters. You’re not only Beautiful but always such a Lady. So, I have a Brother in Law that resides in Santa Rosa. I’ve never been to California. We have a 32 year old Daughter (Amy), she has Autism. Amy Loves Ellen and wants me to drive from Michigan to California so she can meet Ellen. Sounds like a Plan! Your Friend’s Boutique looks Lovely. I live in a Beautiful resort town, it’s on a large Bay on Lake Michigan. Many famous names to drop, Mario Batali co owns a restaurant, Michael Moore owns a couple movie theaters, Madonna’s Family owns a Vineyard. A city nearby, Interlochen has a Fine Arts Academy. Robin Williams Son attended, so did Bruce Willis’ Daughter. During the summer we have large festivals. We’re the Cherry Capital of the World, cherry wine, pies, clothing…the streets are even lined with cherry pits ;). Shortly after that party ends, Michael Moore holds his film festival. We see license plates from everywhere, including Europe. Our Boutiques are quite Incredible too. Our varieties of Lake Fish are excellent and very fresh. The Pie (Grand Traverse Pie Company) has been featured by Oprah, she says they make the Best! Please come this Summer and visit our town. I’ll be walking my 3 little dogs, will look for You. Hope is our middle Furry Girl, she chows on Cherry Pits. I also love this store and the ramekins you speak of! Glad to see you know Maude Woods too! 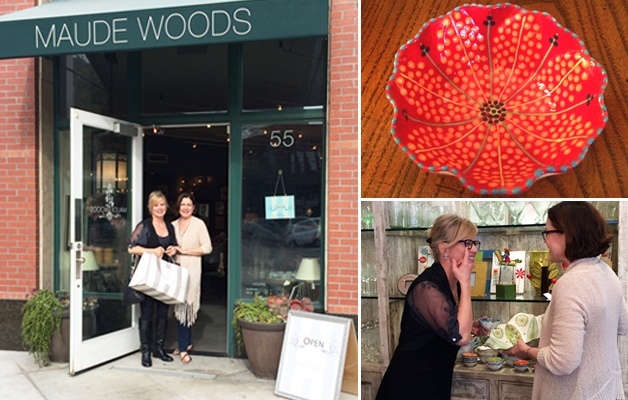 Maude woods owner Carrie and I have been friend since we were 14….SHE ROCKS….I will be telling her story for sure!